Ever have one of those moments where you're too lazy to move and said to yourself, I really wish food would magically appear right now? 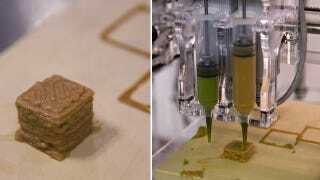 Perhaps a "high idea" (or highdea) in which you thought your printer should be able to print food? Well, that is now a reality. And honestly, we think weed had something to do with it. But whatever. Once Cornell Creative Machines Lab puts these babies into mass production, stores will sell syringes full of liquified food. Things like frosting, cheese, chocolate and other semi-solids will retain their regular properties, while solids like meat and vegetables will be pureed and altered to create the proper baby food like texture. You'll then buy or make schematics, hopefully some created by master chefs from around the world, and enjoy your machine made meal.